We should be very happy indeed, to have the Christmas tree from the island near Calais, Maine. It would be just like something from home. As you know, I have a fifty year familiarity with every inch of the St. Croix River up to and beyond Calais. By the way, the actual site of settlement of De Monts and Champlain has never been definitely proved. I wish you would get some members of the Maine historical society, probably with the aid of a New Brunswick historical society, to try to make a definite determination of this. There are several islands, including the one which forms the harbor of St. Andrews, N. B. which claim the honor. As far as I know, no one has ever dug thoroughly to discover foundations, pewter ware, or other traces. Such traces must exist. 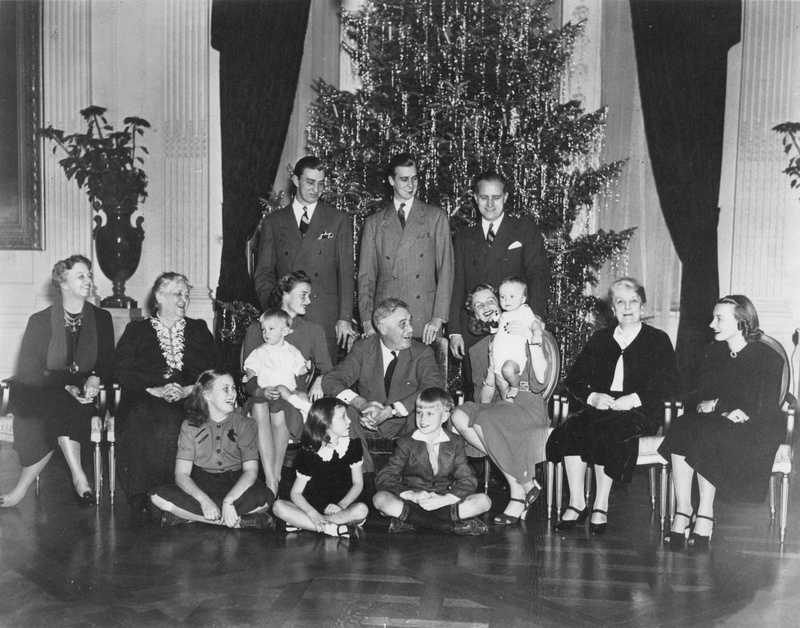 It would be a nice thought to have the Christmas tree from the city where the first Christmas observance on the northern coasts United States was held. The reply was not received until early December and the Calais folks made haste to obtain the tree which was, after all, on St Croix Island with which communications in those days were not easy. Two days after Pearl Harbor they managed to get to the island and John Trimble cut the tree. The keeper and his wife, Elson and Constance Small, were reluctant at first to take a tree from an island with so few large trees. Finally they were convinced that the sacrifice was appropriate given events of December 7th, 1941. 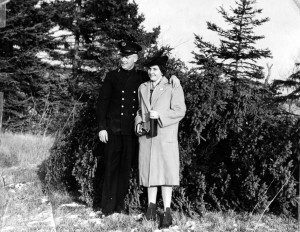 “One day in winter 1941, on December 9th exactly, a signal was seen at Red Beach for Elson to pick up guests on shore. There he found a Mr. John Trimble. Mr. Arthur Unobskey, two businessmen from Calais and a photographer from the State Publicity Bureau in Augusta. Pearl Harbor had just been attacked, starting WWII, and it had been decided to send a Christmas tree from the site of the first Christmas celebrated in North America to the White House in Washington, where President Roosevelt was entertaining Mr. Winston Churchill for Christmas.” A beautifully shaped tree, about 18 feet high, and one of the very few left on the island, was chosen. If it hadn’t been for a historical purpose, I would have felt quite bad to have it cut down.” said Mrs. Small. 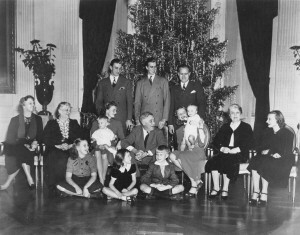 The tree was sent to Maine Senator Brewster and delivered to the White House where it was installed in the family quarters. 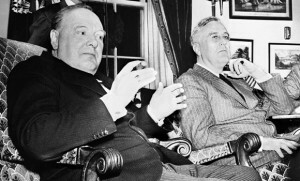 Soon thereafter Winston Churchill arrived to decide strategy for the war against Germany and Japan and it was at this conference that Roosevelt agreed with Churchill that it was imperative Germany be defeated before shifting the focus to the Japanese in the Pacific. This was a very unpopular decision with the American people and U.S. military at the time but few dispute it was, in hindsight, the correct decision. Perhaps it was a decision made after a brandy or, in Churchill’s case, several brandies while sitting in front of a Christmas tree freshly cut from St. Croix Island. 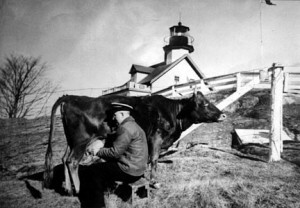 Although Constance Small did not attain the notoriety of either Franklin Roosevelt or Winston Churchill she lived an interesting life as the wife of a lighthouse keeper and wrote a book “The Lighthouse Keepers Wife”, published in 1986 by University of Maine Press. Her recollections of living on St Croix Island and at other lighthouses is well worth reading. The photo below shows her husband Elson Small milking the St Croix Island cow just below the keeper’s house.